Thousands of Kenyan youths have been getting lured into the AIM Global network which promises to turn them into overnight millionaires. “I am excited to share this opportunity with you because this changed my life and most of the people in my organization. I believe that if you are in a struggle to win over financial problems, you are in the right time to learn about this business and give a shot once you learned how it works. The irony, though, is that none of these young job seekers is living the millionaire lives they purport to offer. Take this young lad in the photo below. He offered to turn interested Kenyans who in boxed him into successful people who would earn up to Sh. 45,000 per week. 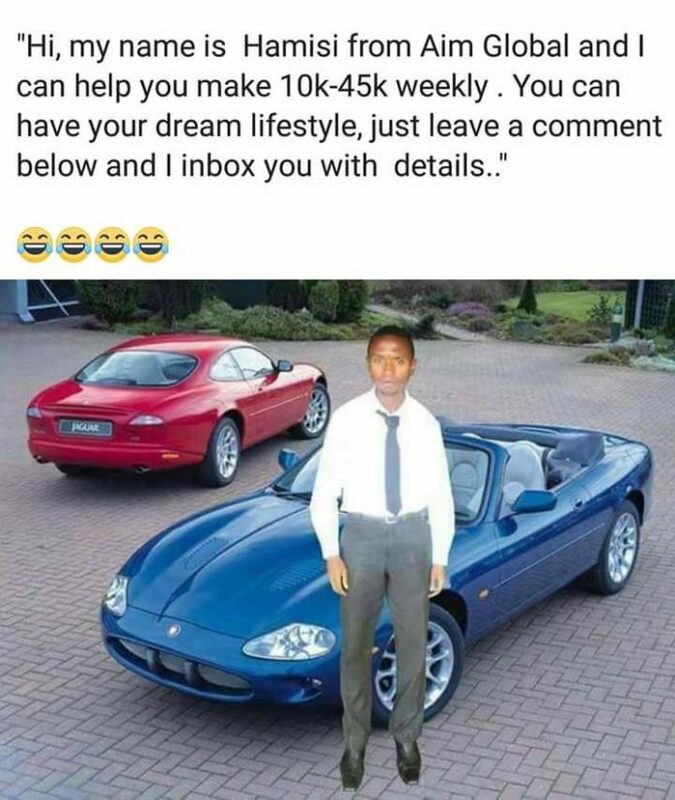 And to portray his success, he posted a photo in which he had posed with luxurious, multi-million cars – only that the photo was a Photoshop in which he appeared to be floating on the ground. This, though is the sad scenario that many Kenyan youths are going through. According to the Standard newspaper, every Monday and Tuesday from 8am, a group of eager and hopeful young people begins to trickle steadily into Room 101 of Stanbank House, the tall brown building adjacent to the National Archives on Nairobi’s Moi Avenue to be enlisted with AIM Global. “The tenant of Room 101 is Alliance in Motion Global (AIM Global), an international company that promises to “turn ordinary people into extraordinary millionaires” within mere weeks. Starting at 10am, AIM Global offers free training sessions, professing to teach the participants how they can generate up to Sh 50,000 each day without much effort. Usually, each session brings together new trainees who, in order to attend the training, have heard about AIM Global by word of mouth or been recruited online or by existing members. The online recruitment process is simple. Typically, a current member will post, mostly on Facebook groups, asking other social media users interested in making money to contact them,” The Standard recently reported. This means that thousands of unsuspecting, desperate kenyan youth may have been conned into parting with the little cash they have saved with the promise of making tens and tens of thousands of money per day. Tired of the job that is not giving you enough income? The capital is Ksh 20,000 or Ksh 21,800. You can see that the package worth Ksh 21,800 has more products than the package worth Ksh 20,000 so you can choose wisely. Aim Global is the best of the Best MLM. do just mislead people do you understand Network marketing? do your Reaseach well understand the difference between a pyramid scheme and a MLM. Aim Global is not a get rich quick scheme. do you want to tell me that a scam is paying tax? the government legalized a scam to operate in Kenya or perhaps you are saying all the countries that have registered Aim Global do not know anything about Network marketing. think and do your research well do not tarnish the name of this wonderful company. YOU ARE THIEVES, WHY DO YOU ADVERTISE FOR DIFFERENT JOBS IF YOU ARE LEGIT. WHY POST THE CARS THAT YOU DON’T EVEN OWN. hey!!!!! stop missleading kenyans, aim global is not in kenya only. we have been in exsting for 12 years. and if its a scam, why am i getting paid??? contact me for more information,[+254740401492] and kindly do your reserch well!!! It’s scam! And you know it…. You got conned,,,, leave us with the little cash we have!!! Spare us bwana! Mmmmm……just smiling from my living room reading through this exciting war of words. This guy who posted the article, besides doing a shoddy research, has no idea what AIM Global is. Sad that fellow who has refused to read just copy pasted everything from a misleading posted on standard digital. He’s sharing the same platform with other local rumour mongers just like him. Now! who tells me the truth about aimglobal, is it a legimate project? Some are receiving money but they are peanuts to the AIM Global consortium no wonder they are giving them out. The investment you make to the company depends on the offer they gave you, which could be in any amount. But the returns/dividends/bonuses that are paid out by them is very little compare to what is retained by them. Talking about the binary system, it gets more things complicated say for example if are registering to invest in a 21 packages, you have to pay around AUD 6,300. This means you are financing the other 21 clients who are people the same as you are. The first thing the company will offer you or return to you to confirm and secure your registration is a AUD 4,380 worth of food supplement, actually 21 packages; secondly a AUD 744 cash return which total up to the amount of AUD 5,364. Now the catch is, since you are financing the other 21 clients at the initial stages, then you start receiving payments when these 21 people also make their investments. Just imagine all of you 21 people invest in the 21 packages, that means you all have to pay AUD 6,300 and it will sum up to the tune of AUD132,300. Can you work out then how much the company will retain from the 21 clients including you? You will be paid AUD 5,364 (4%) only, but the company is retaining a huge amount of AUD 129,936 (96%). Who is really the millionaire here? You will never become a millionaire overnight, but they at the consortium will be. Every investor will boost the company by 96% but the individual client will stay low in that 4%. Don’t you think this is a rip off/scam/what-ever-you-may-call-it? Rip off.. Really. How much do you help your boss make every single month.. And how much do you get paid at the end of that month.. So who is being ripped off.. Even if you get paid 100k ask yourself how much your boss has actually made before you get that and then look at that word again.. Rip off.. Very misleading. Do your research well, don’t just copy and paste things for attention. There is no need to comment or talk about what you don’t have facts or tangible evidence. There are so many legitimate MLM’s, AIM Global being one of them. AIM Global has been in existence for close to 12 years now. Quite a number of people globally have benefited from it. The only challenge which a bigger percentage of people have is being closed minded. Normally very many of us don’t understand the marketing plan of any particular MLM, including AIM Global and that’s why, a majority of those who don’t succeed keep on thinking and talking I’ll of particular MLM’s as being SCAM. The truth of the matter is, when introduced, some people become too exited and some of those who decide to sign up without understanding, end up complaining that, they were conned. During presentation, it is explained clearly, for someone to earn, what is expected when they sign up. Due to excitement, a prospect comes on board having been taken through the presentation. They are given the kit worth what they have paid. At this point, the Company (AIM Global) does not owe them anything. They are expected to share the opportunity with others, at lease 2 people and show them how to duplicate the same. They are told when they bring 2 people on board, the Company will have done business and since the 2 people came on board through them, the Company will share their profit by paying them some potion of the profit. Now whoever understood and came on board, never complains but whoever just heard of the earnings and did not capture what they are supposed to do so as to earn, are the loudest complainants because they didn’t understand the marketing plan. It’s interesting how desperate you are for news.. Some crapy news actually.. I thought you guys were brilliant. That means before publishing some silly information you first need to do your research well You don’t just criticize things just because you don’t understand it.. Aim Global is a legitimate business We pay tax . More than so many organisations, we help Kenyans find another source of income and actually get more youth out of the streets who have been jobless for years.. So don’t come here and give people wrong infor just because you want and audience.. Next time get your crap right before publishing it for limelight. I would Have one statement to this Blogger. 1. The don’t understand something. 2. They just can’t afford that something. And its unfortunate you ‘Mr Blogger’ is suffering from both. AIM GLOBAL is real and even if reincarnation was real I would choose Aim Global over and over again.